Adders are the only poisonous snakes in the UK. You might want to know how to help your dog, just in case they’re bitten when out walking. 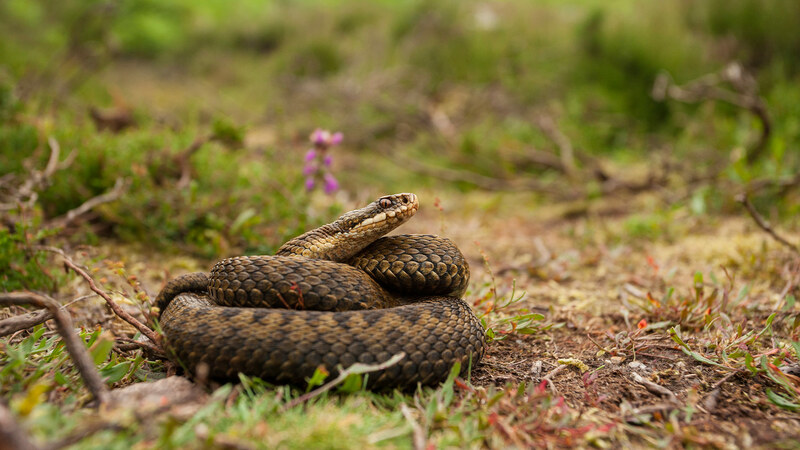 Let’s take a look at adders, the symptoms of adder bites in dogs and the methods of treatment for when a dog has been bitten. An adder bit my dog, what should I do? The adder is the only poisonous snake native to the UK. Nine times out of ten, they keep themselves to themselves, usually basking in the sunshine. Adders hibernate from October and usually emerge from hibernation in the early spring – as soon as it gets sunny! They eat lizards, small mammals and sometimes birds; they rarely bite humans or dogs but when this does happen, it is likely out of self-defence. It’s important to remain calm. 96% of bitten dogs make a full recovery in as little as 5 days. If your dog is yelping or frightened, don’t further their feelings of distress by panicking alongside them. Firstly, you should try to keep your dog still to avoid the venom spreading throughout their body. If you’re able to do so, carry them home or back to the car – the less your dog moves, the less chance the poison gets to travel through their bloodstream. This will also minimise the risk of movement-related pain, especially if your dog has been bitten on the paw or leg. Once you’re home, contact your vet as soon as possible. Treatment: how can my vet help? Treatment will depend on the severity of the bite. A painkiller might suffice, or if your dog has been really badly bitten, the vet may recommend antihistamines or a treatment for shock. In order to restrict your dog’s movement while the bite heals, the vet may also recommend keeping them in their crate for a short while. For more info on other substances that are poisonous to dogs, or on any other aspects of their health, contact your vet. To find your nearest recommended vet or pet clinic, use our Find a Vet page.